National Rally = A total of 49 riders from across Europe and UK rode out to two separate locations. Other riders rode 'off road' on the rally site. Countries represented included England, Holland, Germany, Austria, Czech Republic, France, Belgium, Norway, Sweden, Denmark, Ireland, Wales, Scotland, USA, India and Turkey. The factory showed off one of their new 650 Jawa's as part of an attempt to get into the Guinness book of records for the most people on a motorcycle. Roland Bauer from Rossleben on his 1956 250cc (353). Sebastian Heine from Hannover on a Jawa 350(639) with sidecar. Gary Mertens from Pinneberg, near Hamburg, on a Jawa 350 (638) combo. I rode my 1956 50cc Tree stump, the 1962 250cc Super sport; the 1964 350cc 354 and the 1965 350cc Super sport...or whatever it is. Four Jawa's in one morning...but I didn't ride them but a few blocks each...at least they ran, and all started fairly well, too. Went for a ride today, on the 56' Jawa. Ran very well, a very nice day for it today. It is sometimes hard to keep from opening up the throttle, feels torquey, but I have to keep up the break in. 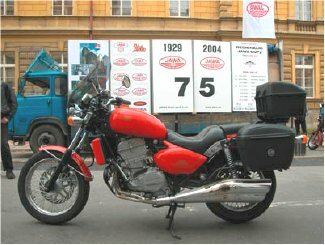 Here is the report of rides on my various Czechoslovak motorcycles on 12, June 2004. It was a beautifully sunny, 60 degree F, day in New York State's northeast farmland. I was pleased to have such a nice day to bring four of my CZ's and JAWA's out for rides on and around the country roads and paths. My oldest bike, a 1946 CZ model A was the one I focused most of my efforts on. There were many trips on a winding circuit of nearby farm fields with each of my young sons on the tank and a number of solo rides just to breathe the warm air. Everywhere there were fields of the first hay-cutting of the year and a number of tractors and "quads" on the roads. Later I took out my 1948 CZ model T on the same roads, but this time only solo. I have pretty bad tires on that bike and limit its use to short solo rides. Because the T has a speedometer I determined my circuit to be about 5 miles with speeds occasionally as great as 35 MPH. I limited my 1968 JAWA 361 Californian to a short trip because, although none of my bikes are registered, I felt this one seemed less easily defended as being "some little old motor bicycle." My experience with JAWA has been mostly with competition in bikes in the sixties and less with the 350 road models. It was a reminder of how much fun the JAWA twins are to ride. The countryside here, the rolling foothills to the Massachusetts Berkshire Mountains is a perfect spot for the Californian's power, good handling and braking. This short ride only whetted my appetite for more and longer trips. I guess I'll need to get this one registered. 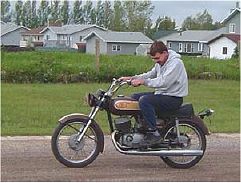 I then trained my attention on the 1973 CZ 400 MX. I couldn't risk the roads, and of course really didn't want to anyway, so off to the woods, paths and fields I went. I usually bump it to a start when cold and in my enthusiasm found myself well into the ride, flying up a lightly wooded hill in second gear, before I realized I hadn't worn my helmet. These days this is seen as needlessly foolish, unlike forty-five years ago when I never wore one except when racing. My attitude changed abruptly, back then, when I took a little twisting slow-speed tumble on my Norton ES 2 single "woods bike," landed ungracefully flat on my back and hit my head hard on the soft moist ground. Two feet to the right, the granite that forms the base of much of New England, lay bare and exposed. I have worn helmets most dutifully ever since. So, I turned back, got my helmet, found a grassy field with a curving border and drop-off near the edge of a wood. I managed to lift the front wheel a bit as I turned to the left crossing the crest of the hill. My mind flashed images of Roger DeCoster and back home I rode, full of the benefits of JAWA/CZ/Yezdi Day. My actual mileage for the four bikes ridden, lays somewhere between forty-four and infinity. Next year I'm starting at infinity and progressing from there. Because "entire world" will be simultaneously riding their Czech designed bikes, I see no reason not to. I rode my CZ 125 A today in between rain spouts! The last ride was dark enough to use the headlight. Worked good, however, the parking light is still kaput! Here is the proof photo that the 477 ran under its own power on Saturday! Not street legal, no lights, no plates, no helmet - just good intentions and a promise of greater and better things! The excitement around my place is like having a new baby at home! I really tried to participate in this year's Jawa day in "real time"… for about 30 seconds! That meant I'd have to be on the road with my 1974 CZ Model 477 Roadster at 2:30 in the morning of Saturday June 12, 2004. It just was not going to happen. I did, however get started at around 6:30 in the morning. My buddy from Horsham, a small town near Crawley in Southern England, arrived on schedule Friday night and was planning to ride with me to the monthly Motorcycling Amateur Radio Club meeting the next day. It would afford him the chance to become familiar with the bike he would be riding for the ensuing week; and provide me company as the lone Southern California C-Z rider participating that I know of. We set out a little past 6:30 in the morning and headed for the meeting in Placentia which, as it turned out, was 21 miles away. Andy was duly impressed with my bike as he has an older Benelli (an Italian bike he maintains at home). We traveled along mostly at 35 MPH but I did manage to get the little bike going over 50 MPH at one point, exceeding the speed limit by 5! We attended the meeting and the picture below shows the prevailing concept of a renegade C-Z rider. That is me with the horned helmet astride my bike. After the meeting we headed back home the same route we took to the meeting. During that return trip the tail light bracket, somehow weakened by vibration over the years, broke at it's mounting and just flopped around held on by the wiring alone. I parked the bike in the garage and covered it up awaiting attention once I returned from a week-long 1600 mile motorcycle trip through Sequoia and Yosemite National Parks and the California coastline with Andy and his wife, Jan. It was Jan's first time ever on a motorcycle and she loved every minute of the trip. The photos show the odometer alongside my watch. The day was cut short by the taillight bracket problem, but I did manage to get in 42 miles. The elapsed time is due to the radio club meeting. All in all, it was a fun day and a great way to start off a vacation. I started early today, I was up and on the road at 06:30 in the morning and I joined up with 80 other riders for the Ride for Sight, I rode about 125 miles today with a diverse group of bikes from the all to common Harley to a clapped out Goldwing as well as a couple of sport bikes. I Calgary police closed down the major north/south highway (all 3 lanes) so that we could run unobstructed all the way out of town, way to cool. I had filled up my fuel tank at a different station this morning and did not realize that they used ethanol in the fuel so about 10 miles in I started to have fuel delivery problems slowing down my already slow bike, once we headed east and didn't have the wind to our face it bike easily cruised at 110 km/h (68 mph). It was only 8°C this morning (about 42°F) and raining so I should get extra credit for that. I raised a couple of hundred dollars and had a great day what more could you ask for. The bike was a big hit with everyone at the ride and I got a lot of comments. So this year I only rode one bike as the other one is gone and the replacement is in the final stages of a complete restoration. Rain or shine, I would have been out there on the 12th, proudly riding her! But, thank God, the weather was absolutely gorgeous! What a nice day for my Pride-and-Joy's first ride ever, with her new 1975 Falta RV 250 engine! Effectively, I spent countless yeah...just ask my Wife!...;-)...) hours taking apart and rejuvenating this superb motor, and transplanted it in my formerly 175 Enduro frame. As the pictures tell, I started with a passenger ride (my Daughter), and then got into serious business!...This year again, it's with great pride that I rode this beauty, especially knowing all of you out there were also doing the same! Well, yesterday was a big day in our household. Got to ride 3 of my Jawa's which, like last year, was great cause for celebration. Getting them all ready and shined up for the occasion is always fun. I never cease to be amazed at how easy it is to get a Jawa going after it's sat for close to a year - well charged battery, check oil and tires, put in gas, kick it over a couple of times and away she goes. Then it's a family affair. I get to boogie on the Jawa's and my wife follows me to get lots of pictures. The weather was a little coolish this year but we weren't to be denied. Didn't actually ride that far - probably 50 miles in total. This year I have the Perak and the '80 Model 350 licensed. The 1979 Model 634 isn't licensed so, again, I was a tad outside the law in having so much fun. Here's the specifics: Bill English, Kamloops, BC, Canada rode: a 1979 Jawa 350 Model 634, a 1950 Jawa 250 Model 11 Perak, a 1980 Jawa 350 Model 634. We had planned a run of about 160 km along the greatest, most scenic coastal road you can imagine. It was just built for motorcycling with curves to the left, curves to the right all the way. There are not too many Jawa's and CZ's in the area but we got five bikes together with the possibility of another couple joining up with us along the way. There was Ken on his 634 combo with wife Sheila in the chair, Harvey on his 639 combo (Harvey has only his right arm so the Jawa's clutch mechanism is a boon to him) and Gordon's 638, my 639 and Allan on a 250 CZ (485?). The weather was perfect. A cold front was reportedly approaching Cape Town but no rain was expected before the evening. After we had got out of suburbia we started on the coast road from Gordon's Bay to Rooi Els where we were to enjoy a leisurely lunch. Now, this coastal road is a series of sweeps and a few tighter corners. It rises from sea level to perhaps 100 m then down and up again along its 20 km length. I was leading with Ken following. As he was rather slower up the hills, having the sidecar with wife aboard, I moved on a bit faster and then waited at the top of the climb - but no one caught up with me. A car pulled up and the passenger called out to me that there had been an accident a way back. Poor Ken had come adrift rounding a corner. It is likely that what happened was that he hit a rock right on the edge of the roadway (this road is known for minor rock falls) which lifted the chair. In correcting, he side swiped a pick-up coming the other way, doing considerable damage to the pick-up, his bike and himself. His wife was uninjured. The good news is that, miraculously, he had no broken bones or internal injuries other than his little finger on his right hand which required surgery. He was released from hospital yesterday but is feeling very sore. Still 20 km short of our turnaround point, we never got to enjoy our lunch! We got the club trailer (we are members of the local Classic Motorcycle Club) brought out, loaded the bike onto it and left the scene at 15:00. The bike is in a bad way with the forks sadly twisted, the frame bent and sundry fittings (headlamp, indicators, etc) no longer of any use. It was a sad ending to what we had all looked forward to as a celebration with the rest of the Jawa world. I do hope that your Rally was a great success. East coast Australia over here it's a long weekend & everything is happening on the Gold Coast of Queensland. Hot Rods & Hogs. If it has wheels then it's on the road in a back to the 1960's Rock & Roll festival at Tweed Heads the states borders. The Wife Anita & I drove 10 hours to stay with my mate Paul Wittmann & his wife Joyce who housed & fed us like royalty & joined us in our Jawa day celebrations & while Paul & I played with our lovely old toys Paul's beautifully restored 1950 / 250 single & my 1950 / 350 twin springer that's been around a while & has a few character marks on it from a lot of use since it was restored again back in 1992. Joyce & Anita did the botanical tour of Joyce's spick & span gardens that Paul gets to play in too when he is not restoring things like vintage Mercedes Benz . Also along for the ride was my 559 / 250 to be used for any guest riders that may need it but ended up posing with Paul's 250 on stage at the Winter sunshine Rally HQ as a static display under our JAWA banner. Paul has done a wonderful job restoring his bike but ill health has stopped him riding it so far, I did the right thing & gave it a good flogging to see if anything needed adjustment & to bed the rings in & it loved the outing after all what are mates for. First day JAWA Day was a navigation & economy run up in the mountain I flew the flag for team JAWA while Paul & Joyce were chauffeured around the course in a BMW. The Rally is a great ride through rain forest areas & sugar plantations with plenty of hills to climb & descend on twisty roads where the JAWA is at its best. With its load of 2 persons rugged up for the shady parts of the trip where it was crisp as we climbed Mount Tamborie on the Queensland side of the state border. I had put down 70 MPG as a target but used less gas than I thought I would & as the task is tough, the winner got within 0.1 of a Lt from his nominated usage over the 161Klm trip mine was 4.8Lt for the trip 2 up & we passed a few bigger bikes on the way. The Vintage bike scene over here is slow at the moment not many older bikes are being used on a regular basis as they are just becoming collector pieces. Our JAWA's are well used as we love & understand their needs & they will run with a modern bike all day, no worries. Sunday was another beautiful day a little cool at 8:08 AM my start time for the days navigation run up the mountain again on different roads & over the border this time. It was the ride here that's important to me as over the years my JAWA's have rewarded me with many useless bits of flash stuff to gather dust on shelves Anita makes me leave them in the shed now for the spiders to play on. My Jawa model 18 just loved the day out & played with bikes a lot bigger than it self & the best reward a JAWA owner can get is to have one of them Pucker Pommy bike riders come over to look it over & ask if it's a 500cc engine " it goes well don't it, it don't smoke but I can smell where it's been". Makes my day. Total number of 'official' riders on the road 12/06/04 = 81 In reality, it was probably a lot more. Thanks to all who took part!